Markus Linnenbrink's work physically and conceptually straddles the line between painting and sculpture. His newest venture is with furniture. In collaboration with Artware Editions, Linnenbrink has created one-of-a-kind console tables. 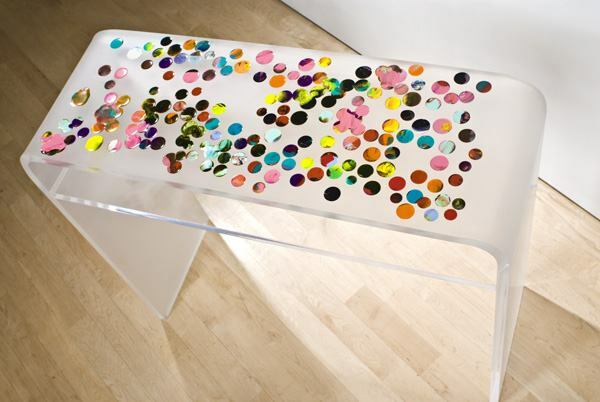 The top surface of the table is hand-designed by the artist who has drilled a "constellation" of holes and then filled them with bright acrylic paint. The end affect is essentially a painting turned into a tabletop. Each table in this edition of 20 is unique and is signed and numbered by the artist. New on the scene, Lauren DiCioccio makes paintings on a sheet of frosted mylar laid over a magazine page. 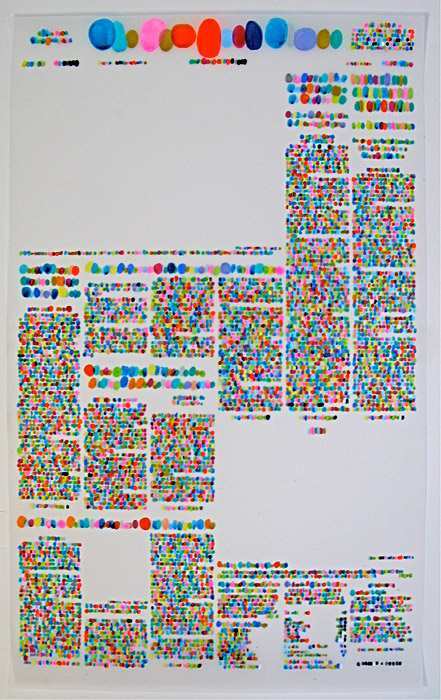 She assigns a color to every letter and applies tiny dots of paint over each letter and number on the page, creating a unique color code and therefore a different palette for each work of art. DiCioccio works with embroidery as well. Another artist fascinated with embroidery is Mark R. Smith. 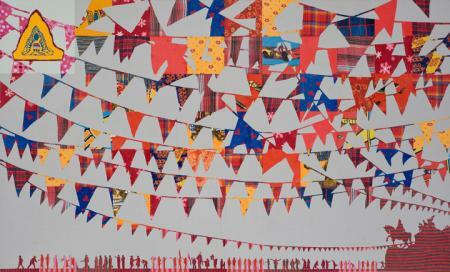 Pilgrimages, migrations, and all kinds of mass movements inspired his latest series of fabric collage paintings. His source material is always the news, both current events that inform his subject matter and the images he actually cuts out of papers and magazines. Although all of Smith's images are recycled, like the fabric he incorporates in his process, the result is original. His procedure, which entails stencils, transfers, reversals and careful planning, yields a well-organized grid of high-art modernist principles. Street art is now making its way into traditional art fairs and museums. 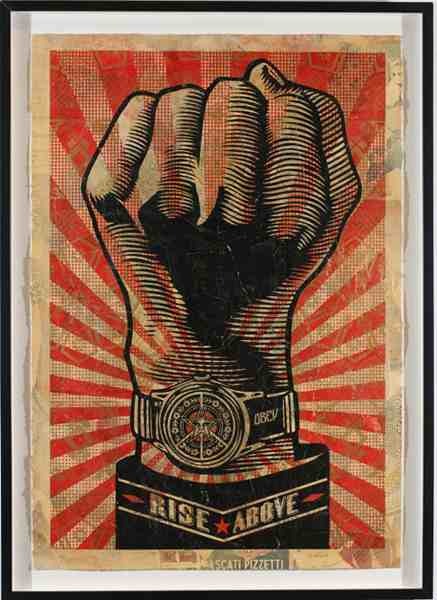 Shepard Fairey has taken it to a whole new level, selling out his entire booth with his politically charged silkscreen designs. Originally emerging from the skateboarding scene, Fairey attended RISD where he earned his degree in illustration. He continues to create provocative large-scale and small collections of screen prints, stencils, album covers, and mixed media pieces filled with humor and irony. 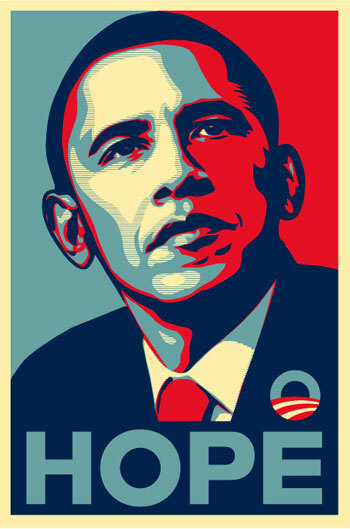 Fairey is also widely known for his recent series of Obama posters supporting the President-elect's candidacy. Photographer Sharon Core initially made a reputation for herself by re-creating Wayne Thiebaud's infamous dessert displays. 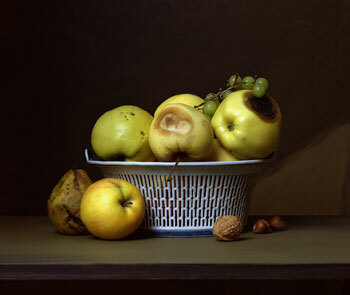 In her latest body of work called "Early American", she is inspired by 19th-century painter Raphaelle Peale and his tabletop still-lifes of fruit. Core's small color photographs artfully capture the carefully arranged lemons, apples and other combinations of food and flowers in Peale's paintings. To accurately document these visual images, Core artificially ages the fruit when necessary and sources the antique bowls, plates and utensils that appear in her photographs. 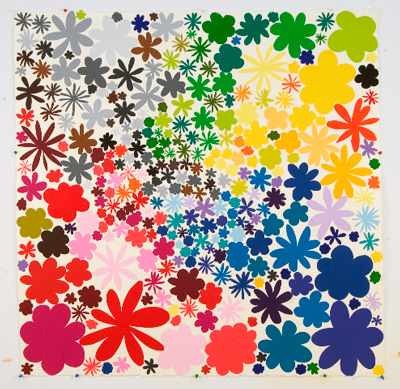 Polly Apfelbaum's new series of "Love" woodblock monoprints are no less intense than her previous works. Prior to placing the blocks in the frame, she individually inks each one before finalizing their position. Once situated, the blocks are pressed into handmade sheets of Japanese paper to create her Pop-like designs. Her work has been included in numerous museum collections such as the Dallas Museum of Art, Chicago Museum of Contemporary Art, and the Armand Hammer Museum of Art. Ross Racine currently lives and works in New York. He imagines large McMansion communities as strange exaggerations by hand-drawing them directly onto his computer and then printing the result on his inkjet printer. There is no photography or scanned materials involved but through digital processes his pictures become very convincing. 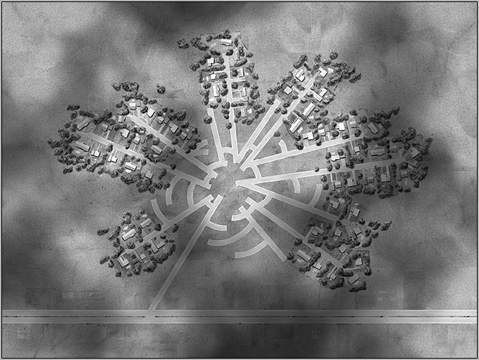 The subject of Racine's work can be interpreted as models for planned communities or aerial views of fictional suburbs. 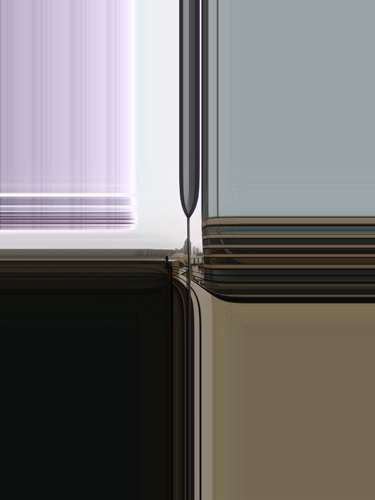 However, he is, in fact, referencing the computer as a tool for urban planning and commenting on society's occupation with transforming our natural landscape into a suburban culture. Christopher H. Martin lives and works from his studio on a limestone cliff in Texas, gaining his inspiration from observing the veining of a marble slab, the alternating colors of the sand dunes, rivers, wood grain, anything rooted in nature. 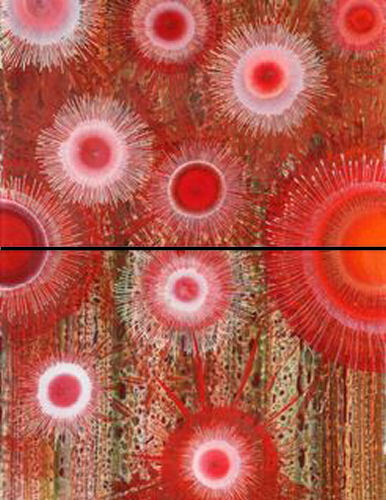 He manipulates acrylic paint on Lucite panels to express this visual take on the universe. 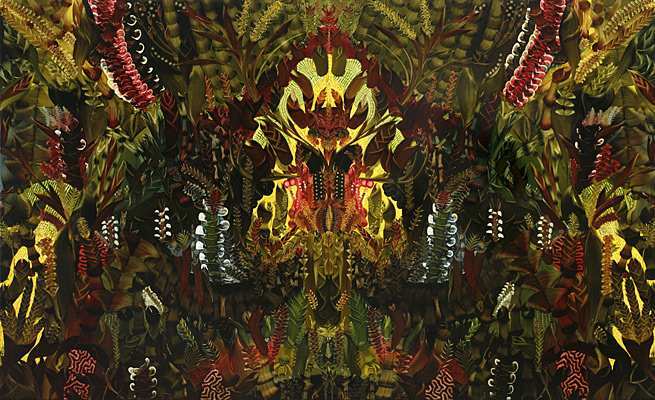 British-born Andy Harper's paintings are an obvious reference to nature with his images of plant life, vegetation, and coral organisms. His process of mark-making is an intense combination of traditional brushstrokes, streams of air from a compressor, the use of homemade tools and his fingers. His work becomes a type of animation, where the manipulation of the paint gives way to a narrative rather than a passive look at a re-enacted world. Prices vary according to artist and size of work but none of the work mentioned above retails for more than $20,000.